Nitride-Bonded Silicon Carbide Shelves are very thin (as thin as 0.394-inches thick), light-weight, and contain low thermal mass. This means giant savings on your back. It also means that your kiln has more room for pottery rather than for the kiln shelves. Nitride-bonded shelves are much stronger than ordinary silicon carbide shelves and they are much, much stronger than cordierite shelves. Nitride-bonded shelves are highly resistant to warping. Their strength lends them to having a much longer working life than other kiln shelves. The larger shelves have expansion joints (which look like small cuts in the shelf), which enhance their long life. The expansion joints relieve stress on the shelf during the expansion and contraction that takes place during firing and helps protect against cracking. Even without the expansion joints, Nitride Bonded Silicon Carbide Shelves outlast most other types of kiln shelves, but this improves them further. WARNING! USE NITRIDE BONDED SILICON CARBIDE SHELVES WITH CAUTION! Never place hands or shelves into an operating kiln. 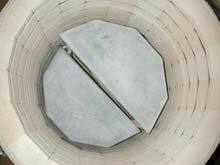 TURN OFF electric source to elements whenever you are loading and unloading your electric kiln. Loading or unloading Nitride Bonded Silicon Carbide shelves in an electric kiln while power is on may result in high voltage electric shock. DO NOT USE Nitride Bonded Silicone Carbide shelves in an electric kiln if elements are dis-lodged or hanging from element channels. DO NOT ALLOW nitride bonded shelves to get wet. Although we are not aware of specific deteriorating, fracturing or exploding problems with our nitride bonded shelves, some other types of silicon carbide shelves have been known to explode when fired wet.